Source: Greenwich News and Graphic. Friday, May 23, 1919. Page 1. 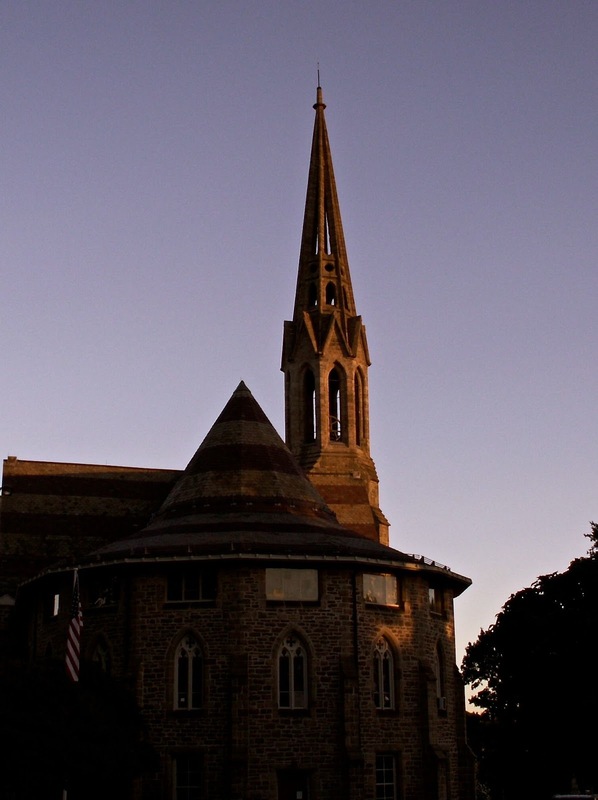 Sunday morning, May 25 is the date set for the dedication of the new spire and Victory bell of the Second Congregational church. The exercises will begin at 10 o'clock, and part of the program will be carried out on the church grounds. There will be addresses and music in the church edifice of an appropriate manner. It is expected that the bell, which is being constructed at the Menelly Bell Foundry will arrive here in a few days. The head ringer has been in Greenwich during the past week making the necessary preparations for installing the bell in the belfry. It weighs 3000 pounds, is fifty-five inches across, and bears the inscription, "Glory to God in the Highest." Later a bronze tablet will be placed in the vestibule of the spire in memory of six generations of deacons in the family of Charles N. Mead, the donor. The new victory spire recently rebuilt at a cost of approximately $65,000 is a notable piece of architecture. As the old spire had for many years been a guide to seafaring men along Long Island Sound, so will the present one be regarded as a landmark for many generations to come. The church itself stands on the highest point of ground between New York and New London. Source: Greenwich News and Graphic. May 23, 1919. Page 1. The old clock in the steeple of the Second Congregational Church is again silent. 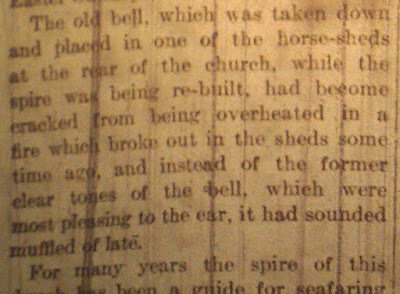 It had to be removed, by the Howard Clock company, together with the old bell, stairway, and electric wiring for the installing of the new victory bell. A ringer and other workmen from the Menelly Bell company of Troy, New York began the work of hoisting the new bell to the belfry yesterday. On Sunday morning, May 25, the dedication exercises will take place on the grounds in front of the church, to be followed by a service in the audience room. A quartette of brass instruments will play selections from the belfry, and there will be special addresses and music. The bell is a gift to the church by Charles N. Mead in memory of six deacons in the Mead Family. The quartet of brass instruments will also play in the church, and at the close of the service just as the clock strikes twelve, ten young women, dressed in white, will sing from the belfry, under the direction of Mrs. Nathaniel Webb, accompanied by the brass instruments. 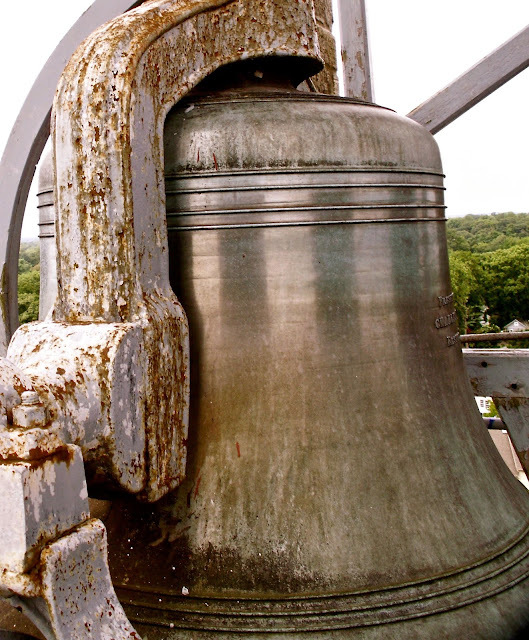 The bell now being installed in the tall tower of the Second Congregational church by workmen from the foundry of the Meneely Bell Co., Troy, N.Y., is of 3,000 pounds pattern, in the musical key of E-flat, and has a diameter at its mouth of 53 inches. The combined weight of the bell and its fixtures is 4,500. This bell replaces the one of similar weight, made in Maryland some years ago, which fractured while being rung last November 11 to celebrate the signing of the armistice. The new bell is the gift of Charles N. Mead, who is of the sixth generation of the Mead family that has been identified with this church as deacons, Ebenezer Mead having settled in Greenwich in 1663. The Second Congregational Church possesses one of the finest belfries in America, and there is some talk of adding at a later date nine bells to the present one so that the church may obsess a complete chime of ten bells. The church is said to be located on the highest point of land along the Atlantic coast between Maine and Florida, and the new bell will probably be higher above sea level than any other bells along the cost, except those in the Metropolitan tower in New York city. The head rigger who is in charge of the work of placing the bell, will, next week, go to West Point to superintend the installation of a chime of bells which the Meneely Bell Co. has completed for Cadet Chapel as the gift of Mrs. James M. Lawton in memory of her father, the late Major-General Robert Anderson, who commanded Fort Sumpter at the outbreak of the Civil War. Source: Greenwich News and Graphic. May 30, 1919, pages 1 and 3. The spire of the Second Congregational church recently re-built, together with the new bell presented by Charles N. Mead in memory of six generations of deacons in his family, as a "victory and peace bell," was dedicated last Sunday morning with unique and impressive exercises. Processional of choir and Sunday school, with banners, the Boy Scout Guard of Honor leading, "Stand Up, Stand Up for Jesus;" presentation of bell, by donor, Charles N. Mead; reception of bell by congregation, through W. F. Day, chairman of the business committee; historical sketch of the three church bells by Miss Julia E. Bell, next by Henry Dayton; dedication service for bell, special hymn, written by pastor, Dr. Huckel, "The Message of the Bell;" unveiling memorial tablet, by Rhoda and Margaret Reynolds; prayer and benediction. 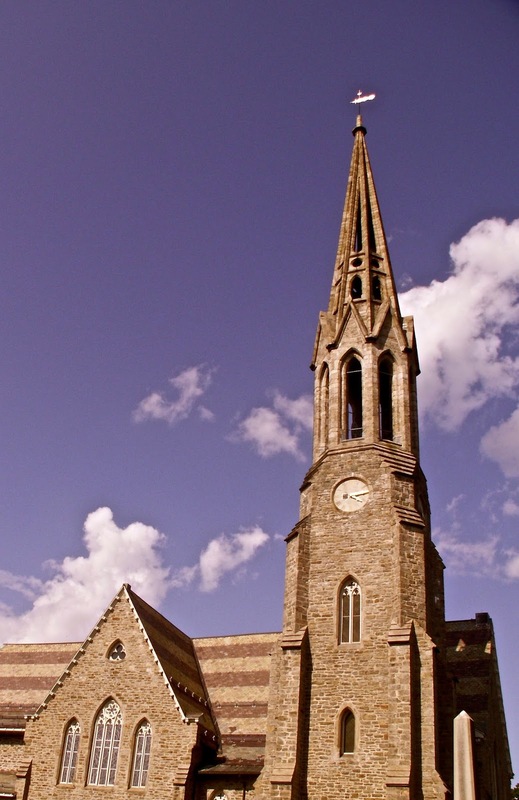 At 11 o'clock, another program was carried out in the church, which was as follows: Hymn, "How Firm a Foundation," invocation, anthem by choir, "Except the Lord Build the House;" presentation of the spire, Wilbur S. Wright, chairman of the Spire Building Committee; reception of the spire by the congregation, through Oliver D. Mead, who was present at the dedication of the former spire, Judge Frederick A. Hubbard, solo, by Frederick S. Studwell, from Sohiller's "Song of the Bell;" dedicatory service for the spire; social hymn written for the occasion by the pastor, Dr. Huckel "The Message of the Spire;" prayer, announcements; offertory; Caronation march, trumpets; address Dr. Huckel; Hymn with trumpets, "God of Our Fathers;" seven-fold benediction. As the clock struck 12, the congregation again assembled in front of the church, where patriotic hymns were sung from the spire by twelve young girls, led by Mrs. Nathaniel Webb, accompanied by the trumpets. The selections were "America the Beautiful," "Mine Eyes Have Seen the Glory," and "My Country 'Tis of Thee." In the narthex of the church has been placed the memorial tablet, also an illuminated quotation from Ruskin in a suitable frame presented by Dr. Huckel, the memorial tablet and another tablet giving the names of the six deacons, with the dates of birth, in whose memory the bell was given. 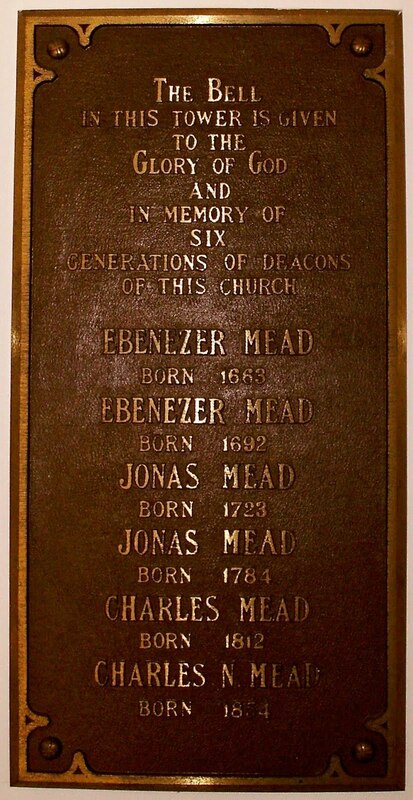 They are Ebenezer Mead, Ebenezer Mead, Jonas Mead, Jonas Mead, Charles Mead and Charles Mead. Fifty-two years upon a similar occasion, this audience room was filled with your farebeats at the celebration of the use hundred and fiftieth anniversary of the establishment of this Church. Back of the pulpit between columns of the arch was strung in letters of evergreen, garnished with the gold and russet of autumn foliage these words: "In the place of the Fathers are the Children." Our fathers God is our God, and to-day the children are in the lace of their fathers. They are the ones to whom we are indebted for this hole edifice, and its commanding spire. On the Committee of Arrangements in 1866, numbering forty-two, only George H. Mills, survives. These who gathered here on that occasions were the Meads, the Pecks, the Reynolds and some others, who with the reverence of the Almighty in their hearts followed in the precepts of their fathers, and devoted energy and money to the building of a house of worship. This is the third one standing upon this hilltop, but of the buildings that preceded this, it is not my purpose to discuss. In the middle of the nineteenth century there was a strong desire for a new Church edifice to take the place of the white frame building with its simple and graceful spire, built in 1798. The history of the spire we dedicate to-day, becomes therefore merged in the history of the edifice itself. The strong desire for a new church building at that time was claimed by some to be without reason. The number of meetings held by the Society to discuss the subject, and the various resolutions and counter resolutions that were offered, show clearly that there was not unity on the subject. 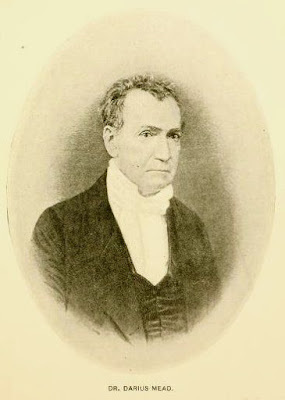 Of the younger men prominent in the matter was Robert Williams Mead, then but forty-four, a successful son of that old patriarch Dr. Darius Mead, the greatly beloved Town physician, who generally was the dominating influence in local affairs. 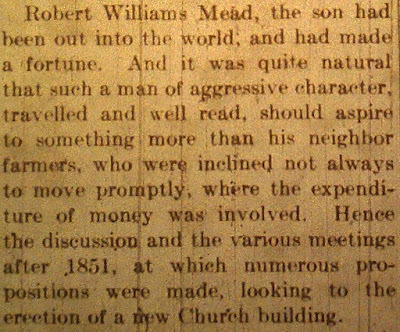 Robert Williams Mead, the son had been out into the world, and had made a fortune. And it was quite natural that such a great man of aggressive character, travelled and well read, should aspire to something more than his neighbor farmers, who were inclined not always to move promptly, where the expenditure of money was involved. 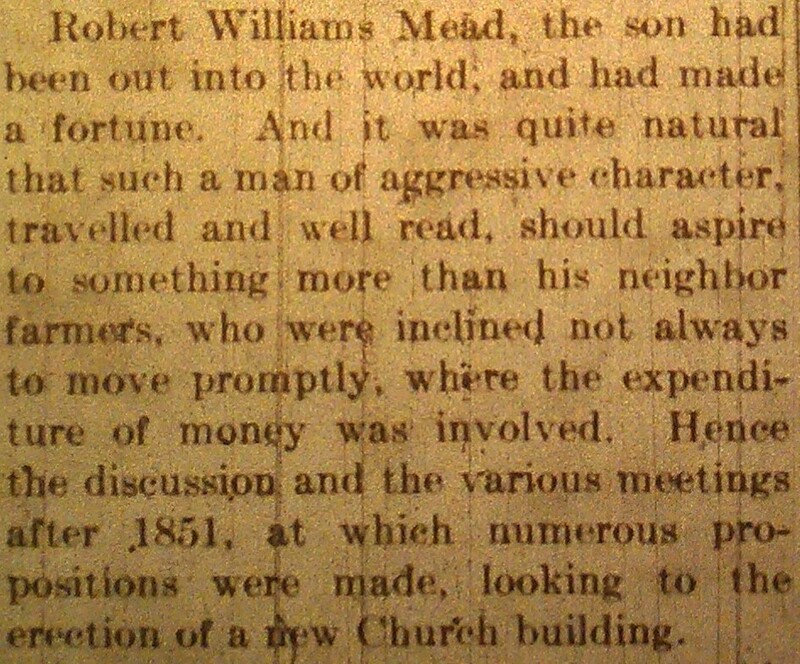 Hence the discussion and the various meetings after 1851, at which numerous propositions were made, looking to the erection of a new Church building. 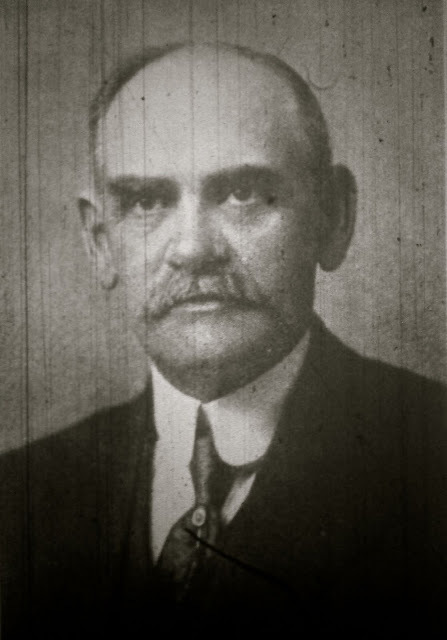 Mr. Mead had inherited from his father Dr. Darius, not only high character, but firm and rigid persistence. There may have been hard things said of his judgment when he unfolded his plan for the present edifice. But he was building for generations yet unborn, and he possessed an abiding faith in the future of his native town. He believed the structure (the restoration of a part of which has cost $65000) could be built for $32,500. The Society has expected to spend for a new building, first $10,000, then $15,000, then $20,000, but when the larger cost of $32,500 was suggested, there was decided opposition. This is shown not alone by the votes, but from the fact that at every meeting, resignations were offered, and members withdrew, while new ones joined. 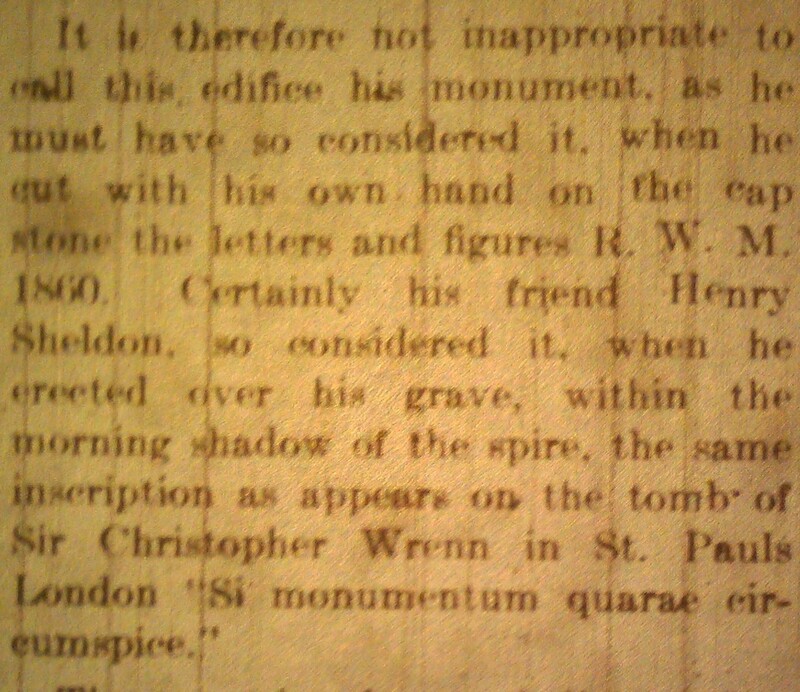 But Robert Williams Mead had made up his mind to have an edifice of granite rather than of wood. Finally he triumphed in an affirmative vote of 28 to 6. The opposition had declared that the plans could not be carried out for $32,500, and as the boys say, so one of the opposition said to Mr. Mead, "I stump you to do it." This tradition is confirmed by a parenthetical statement in the record which reads as follows: "This proposition was made by R. W. Mead in open meeting by a member of the Society that the cost should not exceed this amount, he was in a measure forced to accept the proposition." This memorandum is in Mr. Mead's own hand writing as he was clerk of the Society. As first contemplated, the spire was to be of wood, covered with slate, and this plan was adopted on Mr. Mead's bid t do the work for $32,500. But subsequently, and doubtless influenced by the architect Leopold Eidlitz, Mr. Mead conceived the idea of building a spire wholly of stone, an it was finally completed. This subject was under consideration from the 21st of June till October 27, 1856, when a change in plan was voted. At the same meeting it was voted to secure new subscriptions, and to abandon pew doors, for which item, Mr. Mead, the contractor, was given a credit of $500. Few additional subscriptions were obtained for this purpose, but subsequent records show that the contract was executed for $32,500 and the final report of the Building Committee accounts for an expenditure of $46,300, which included furnishings, furnaces, lightning rod, organ, lights and outside grading besides the construction of a bank wall. 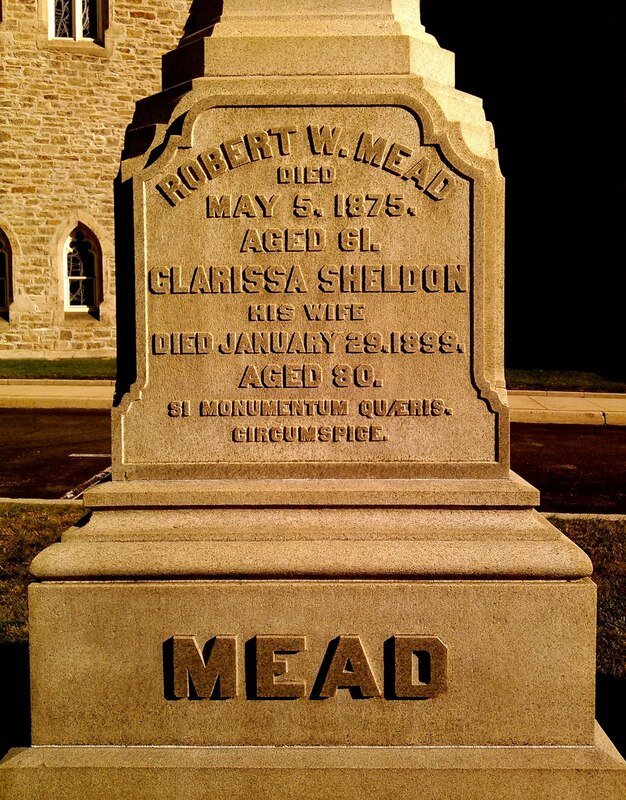 It is well known, that Mr. Mead having exhausted the Society's appropriate, sold his own securities to complete the building, notwithstanding the fact that he was the largest contributor, having paid in $5,000 among the original subscriptions. It is therefore not inappropriate to call this edifice his monument, as he must have considered it, when he cut with his own hand on the cap stone the letters and figures R.W.M. 1860. 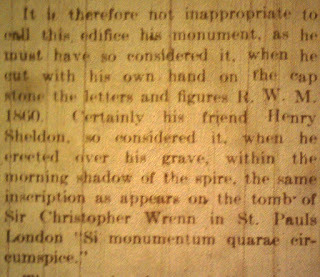 Certainly his friend Henry Sheldon, so considered it, when he erected over his grave, within the morning shadow of the spite, the same inscription as appears on the tomb of Sir Christopher Wrenn in St. Pauls London "Si monument quarae circumspice." The new church was dedicated December 9, 1859. It is interesting to read the names of those who contributed to the building of this noble structure. They were from all denominations, and some of them were non-residents; one living in California- a Mead- who in that far away place in true gold diggings has a warm spot in his heart for the church of his parents in his native Town. Of the list of subscribers few survive. The children are in their places. In some cases the same name has been perpetuated among our members and residents. When it was voted that nothing but native granite should be used for construction, Frederick Mead, Senior, voluntarily opened his quarry for that purpose. The building contract explicitly provided that Robert Williams Should finish his work in two years. But for more than four years, the farmer's patient oxen hauled stone up Love Lane, now Milbank Avenue, and an old white horse walked stolidly around a windlass that slowly lifted the stone to its place. What a contrast with present-day methods. The Charles T. Will Company with modern appliances took the steeple down, and rebuilt it thicker and stronger in less than two years. The early description of the view from the hilltop found in several publications is in marked contrast with the present-day view. Then the Sound, visible from the ground, extended like a ribbon of blue from Execution Light to the Norwalk Islands. 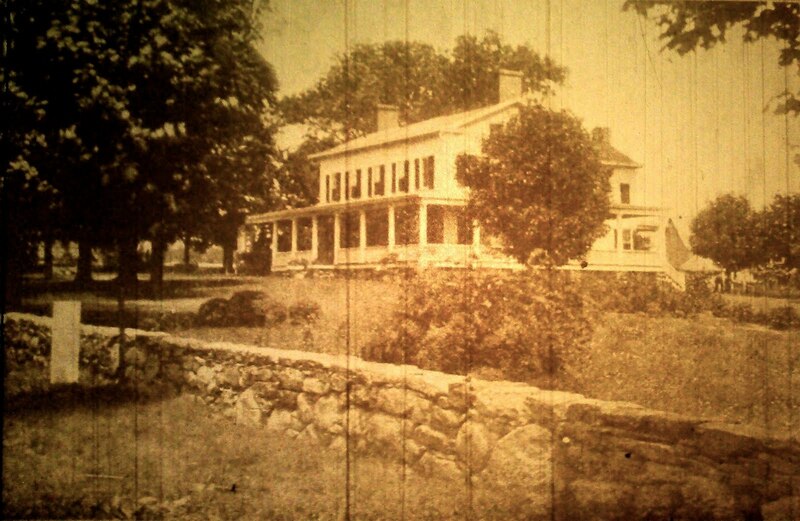 Between he shore and the main country road, as Putnam Avenue once was called, was the cultivated land and the open pastures of our local farmers. Modern tree planting and house building have largely cut off the view in that direction. But toward the north from the elevation of the bedeck, is seen the northern part of the town, including much of Stamford and New Canaan on the East and Westchester County on the West. Round Hill, the southernmost foot hill of a chain that runs north one hundred miles, terminating in Mount Graylock, the King of the Berkshires, is always visible. If our view is so extensive, it follows that the spire is visible on land and sea over a wide territory, whose occupants have welcomed it back with heartfelt gratitude. Source: Greenwich News and Graphic. Friday, February 14, 1919. Page 1. Announcement was made at the morning service of the Second Congregational church last Sunday, that Charles N. Mead had presented a bell for the new spire, in memory of six successive generations of deacons in his family, serving this church for nearly 200 years. It will be a victory and peace bell, bearing the inscription, "Glory to God in the Highest, and on Earth Peace, Good Will Toward Men." It will be cast at the Mencely Works in Troy, and probably will be installed by Easter Sunday. 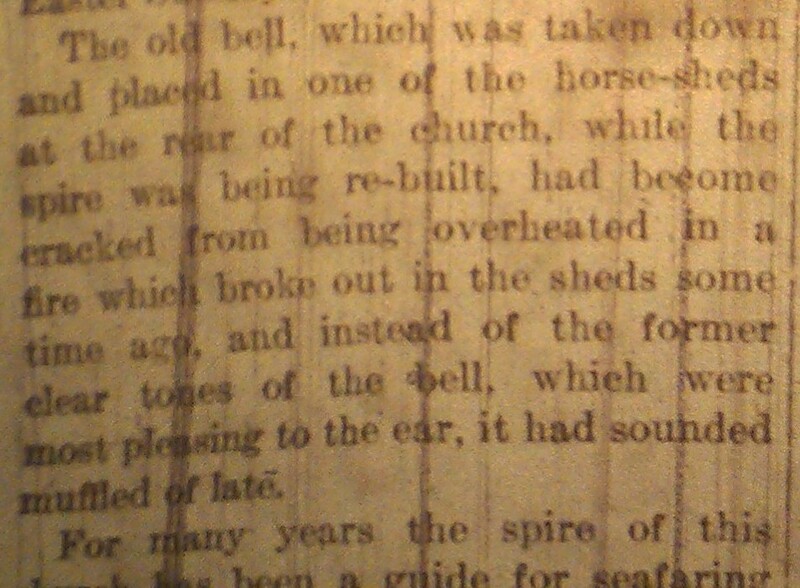 The old bell, which was taken down and placed in one of the horse-sheds at the rear of the church, while the spire was being re-built, had become cracked from being overheated in a fire which broke out in the sheds some time ago, and instead of the former clear tone of the bell, which were most pleasing to the ear, it had sounded muffled of late. For many years the spire of this church has been a guide for seafaring men on Long Island Sound. The church itself stands on the highest point of land along the Sound between New York and New London.